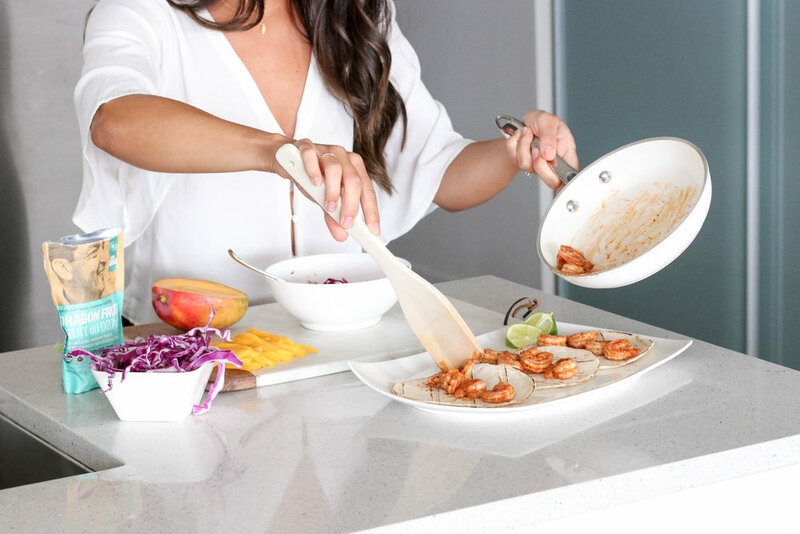 "I wanted these tacos to be a dish that would nourish body, mind, and soul – they are packed with body energizing ingredients from cruciferous cabbage to fight inflammation, mango for a kick of antioxidant vitamin C, and protein packed prawns tossed in a kick of cajun that balances perfectly with the sweetness of the fruit. If you’ve been practicing a more mindful approach to eating, take in the colors, smells, and textures of this meal. The crunch of the dragon fruit seeds is such a nice finishing touch! These are also the perfect quick and easy (shhh! Don’t tell anyone!) dish to whip up for guests. Keep all of the toppings separate for a little taco bar so guests can top as they please!" 1. Combine all Slaw ingredients, except for the dragonfruit, in a small bowl. Stir to combine and set aside. 2. Next, combine the chili powder, cumin, salt and pepper in a small bowl and stir to combine. Add the shrimp and toss to coat evenly. 3. Heat oil in a large frying pan over medium high heat. Once hot, add garlic (you can test this by adding a small amount of garlic, it should start sizzling). Saute until it starts to become fragrant, 1-2 minutes. 4. Add the shrimp and allow them to brown on the first side without stirring, 2-3 minutes. This will allow the flavor to build. 5. Flip them over and cook another 2 minutes or so, until opaque. Turn off the heat and give them a stir. Allow them to sit in the pan for another couple of minutes. The residual heat will gently finish cooking them. 6. Just before dishing up, add the dragonfruit to the Slaw. This will ensure it stays nice and crunchy! 7. Heat your tortillas in the microwave or oven if you prefer them warm. Divide onto plates and top with the shrimp, Avocado, Slaw and finish with cilantro to garnish. Cook the rice in a pot over medium heat. Reduce the heat when the rice begins to boil. Once all the water has been absorbed place the lid on the pot and let rest off the heat. Place the next eight ingredients into a stainless steel bowl, add the rice and stir with a spoon. Add the melted coconut oil and season to taste with salt and pepper. Serve warm or let cool to room temperature, whatever your preference.